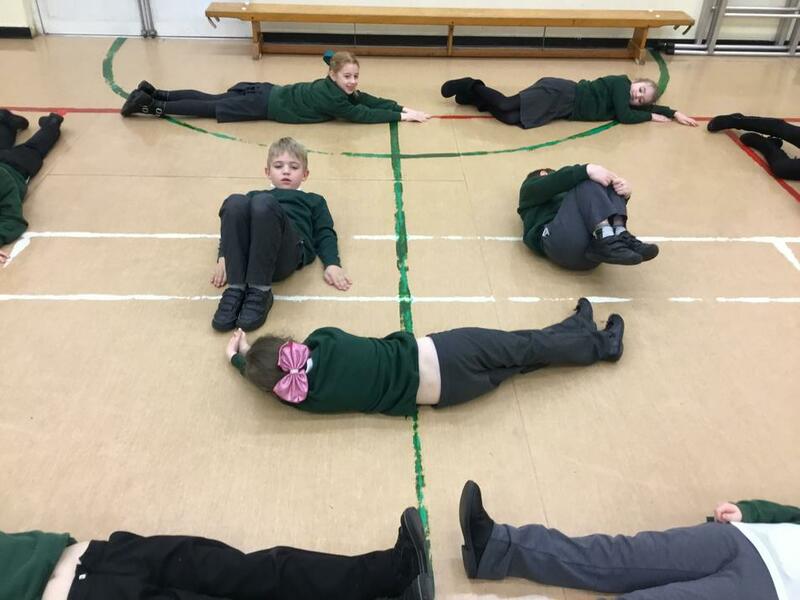 Hope you all have a restful half term break and come back ready to continue all the hard work undertaken since Christmas - well done and keep it up. 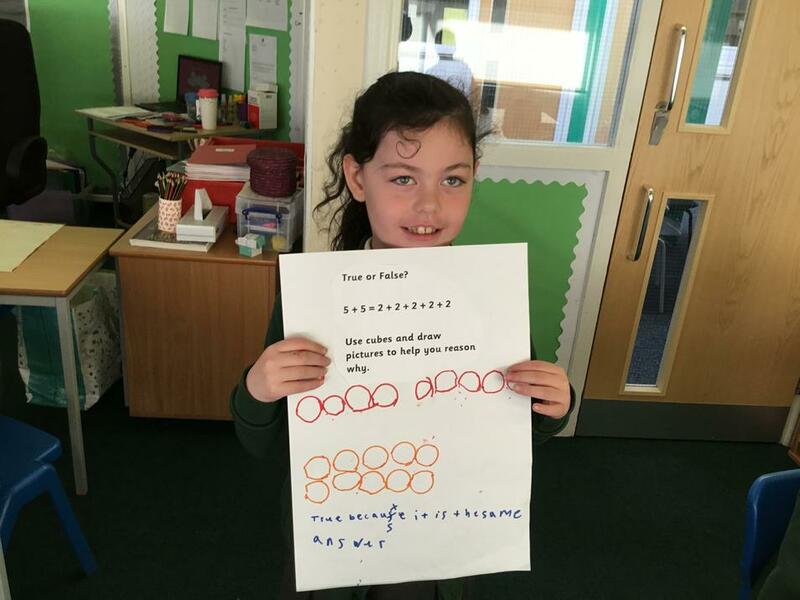 It was a brilliant end to the half term for Mrs McGovern's class. Hard work pays off and the 1000 points Class Dojo goal was met and the week ended with a treat - popcorn and a movie. 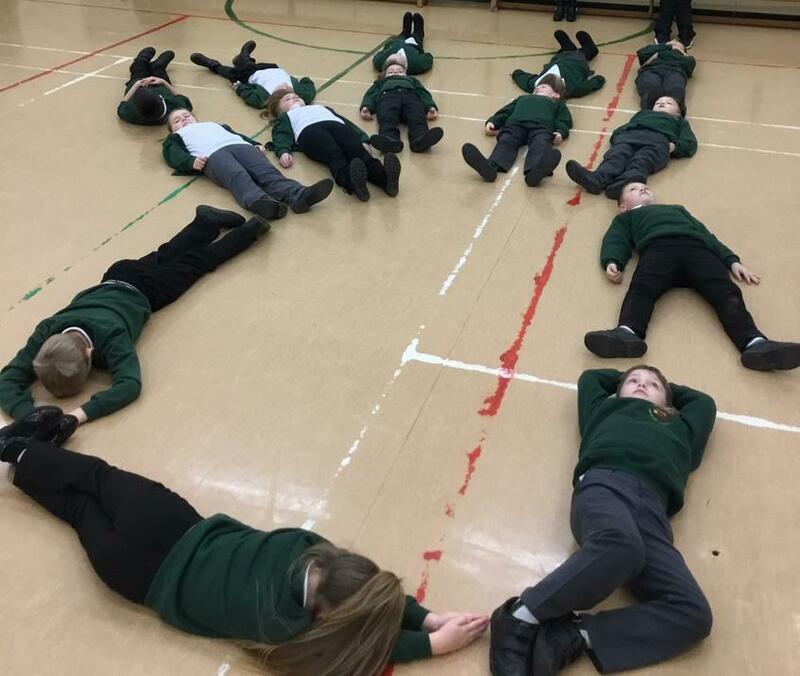 Well done class you deserved that treat. The hard work now begins for the next one. 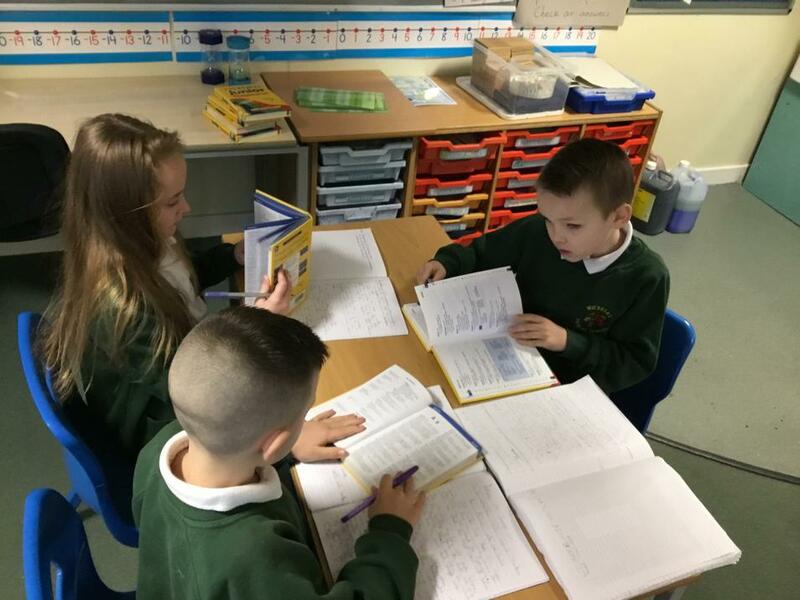 In English we have continued with The Lost Happy Endings a book that is proving really popular with the whole class. Lots of book talk and imagery work including drawing what we imagined a scene might look like just by listening to the text without seeing the author's own illustrations. 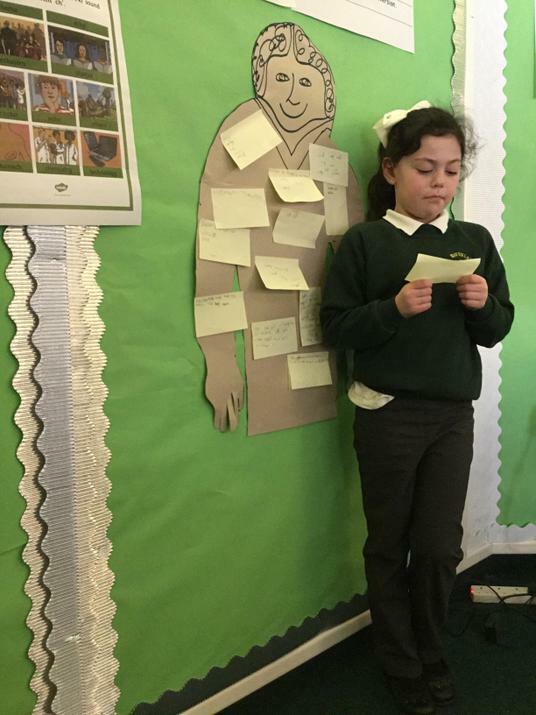 We ended the week writing a diary entry based on the main character Jub and her job of collecting the lost story endings. 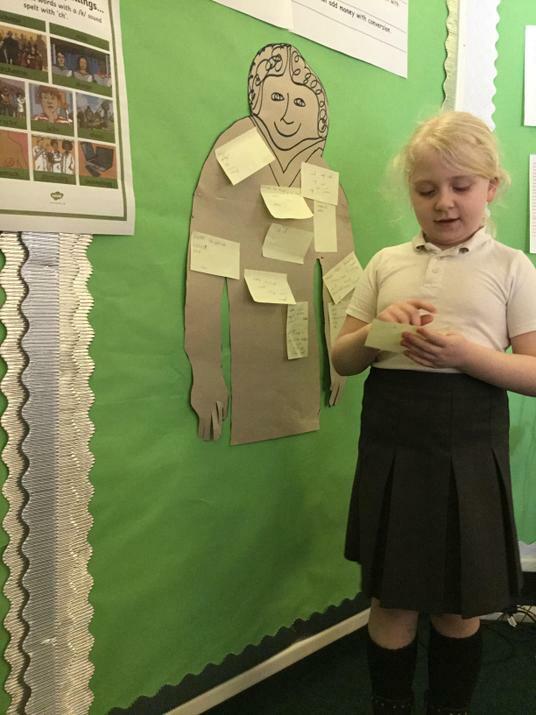 The next phase will include using similes and personification to write a setting description. 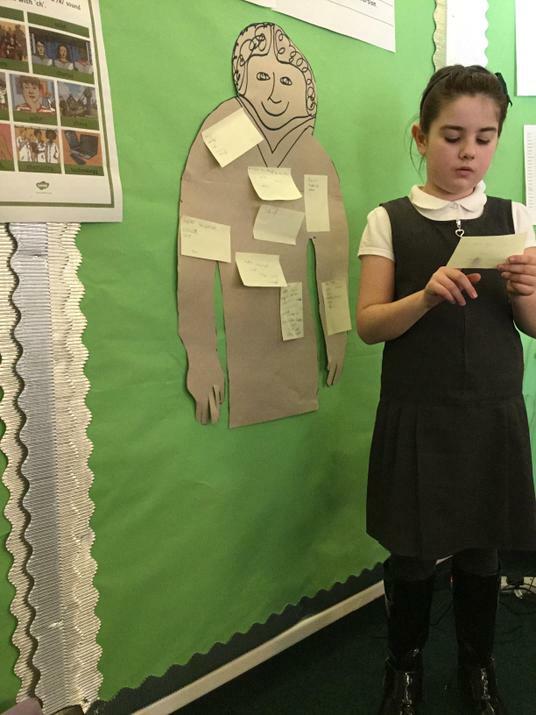 Then continuing with our book talk we will work towards writing our own versions of the next part of the story. 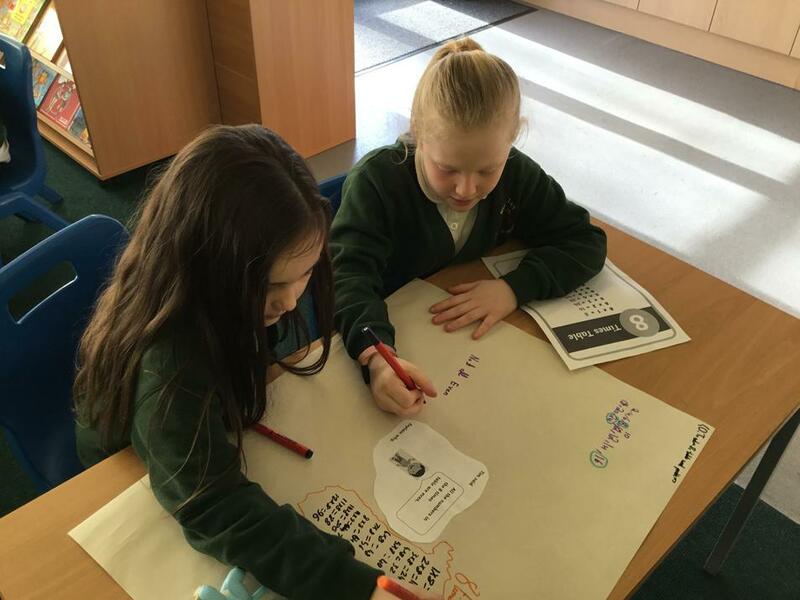 In Maths we are coming to the end of our unit of Measurements - Money. 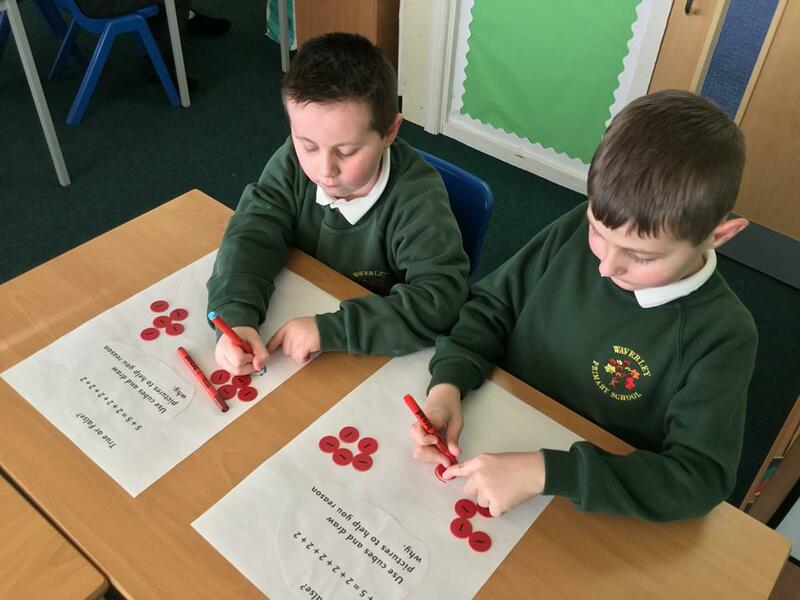 Lots of strategies learnt and used to add and subtract money. 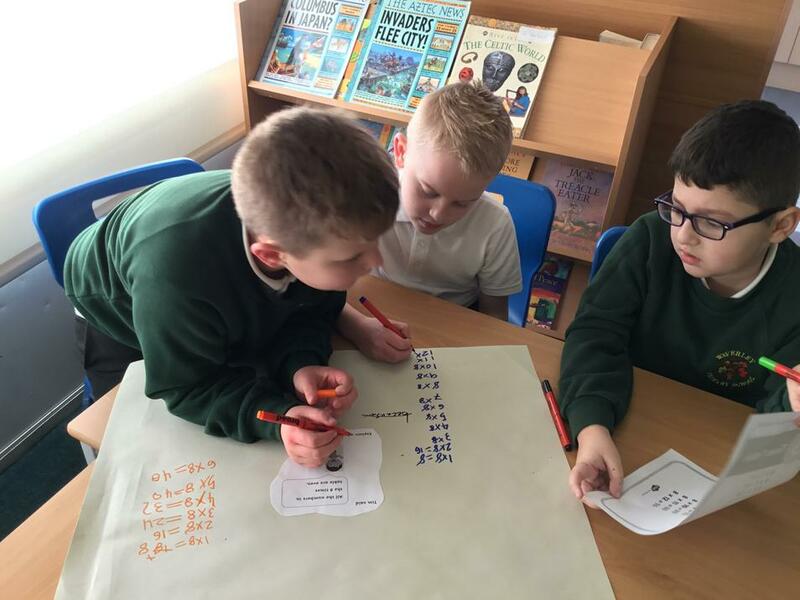 Reasoning and problem solving skills are being used for real life money problems - working with a partner to develop peer learning, collaboration skills and Maths talk. 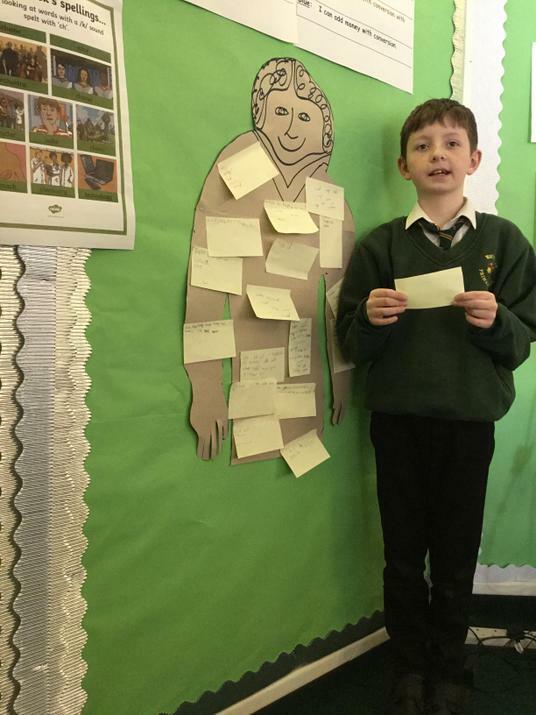 What a fantastic end to this half term, in class 3M we have finished writing about the Iron Man falling off the Cliff onto the sandy beach using a range of figurative language. 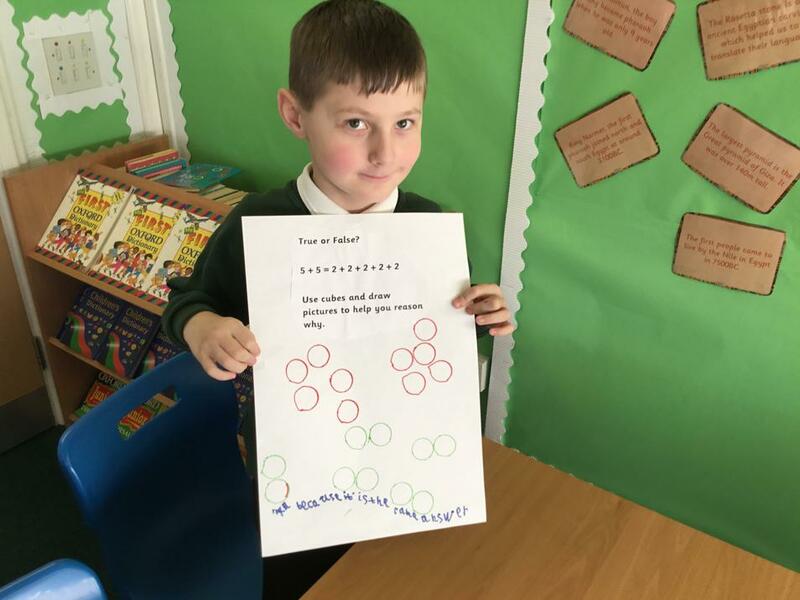 Well done to Daniel who won our times table competition by completing his times tables in less than 5 minutes- he was only four seconds off from beating Miss Mole (I'm sure he will next time). 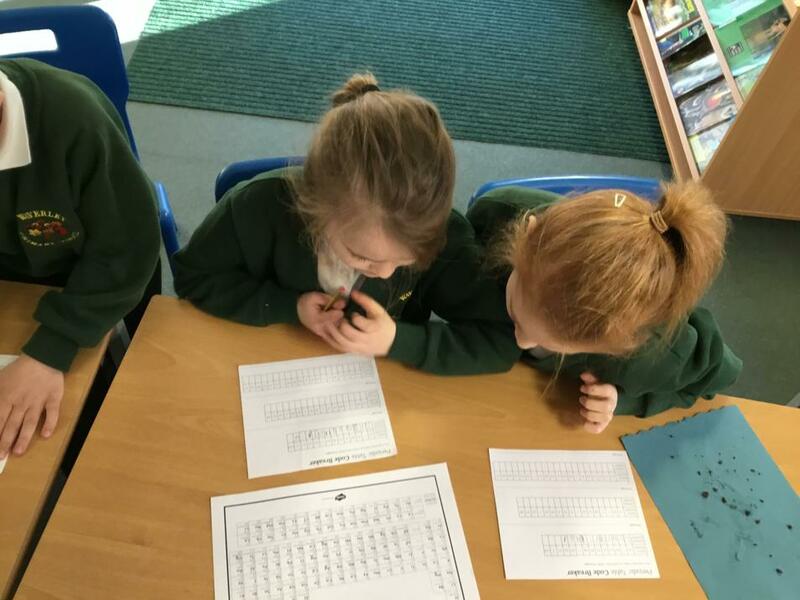 Also the Buzzing Bingo homework activities are rolling in, well done to all the children for all their efforts (and parents). Marley can't get enough of the Buzzing Bingo activities and is obsessed with all the human body organs- especially the wibbly wobbly jelly brain. 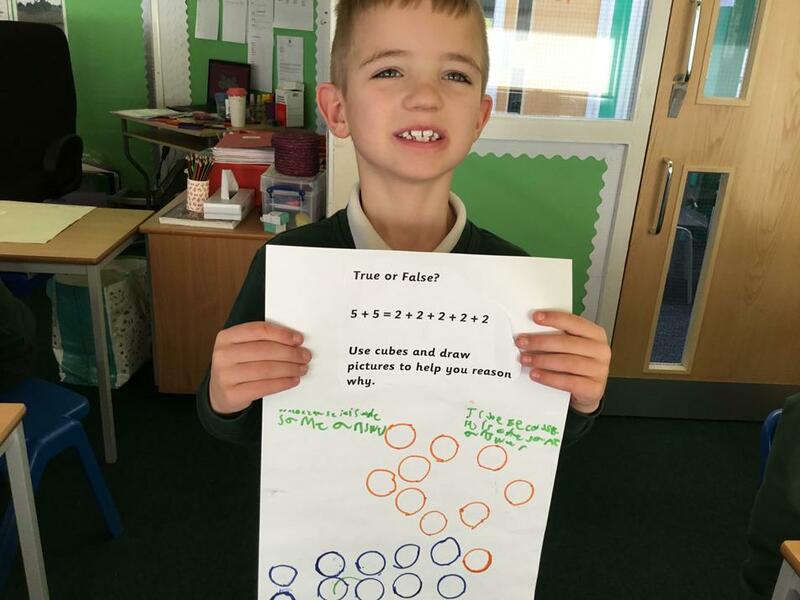 During maths, we have been adding, subtracting and working out the change that should be given from buying several items. 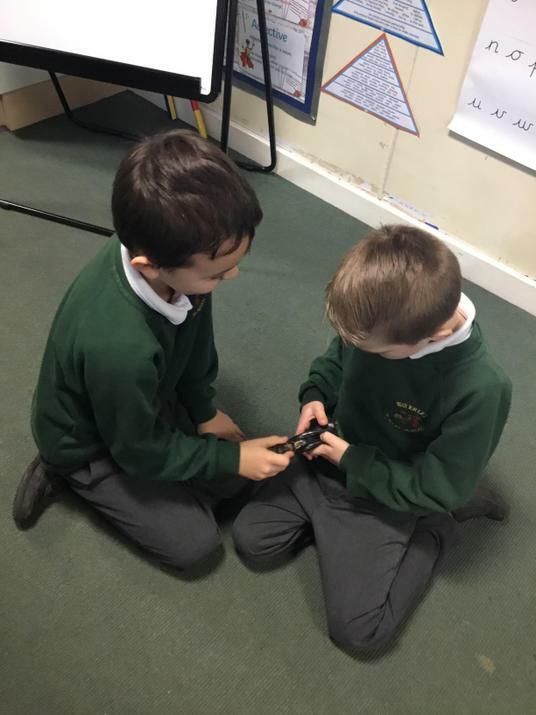 We pretending we were buying items from a shop and would work in different sized groups to work how much we had spent as well as how much change we would get if we had various amounts. 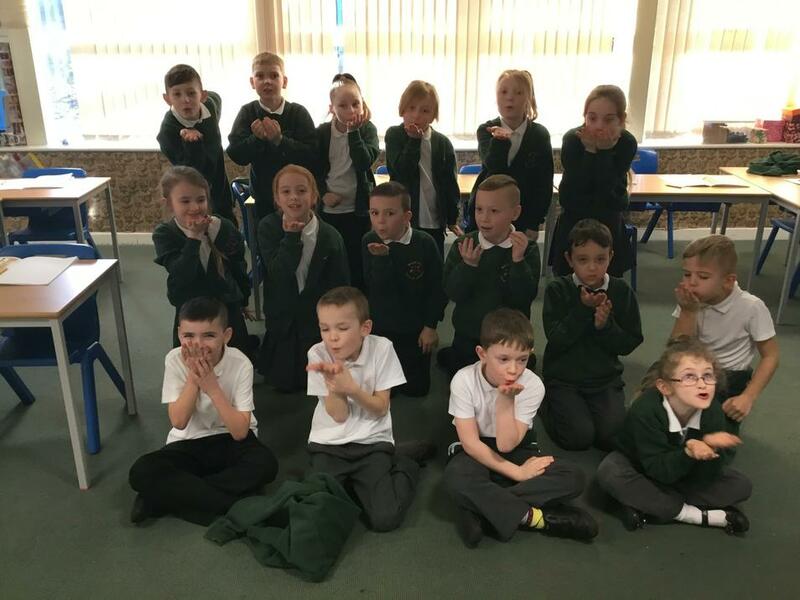 With LOVE being a key theme this week we have been learning about the origins of Valentine's Day especially with the Valentine's disco and all those children who were desperate to write a card for that special someone . 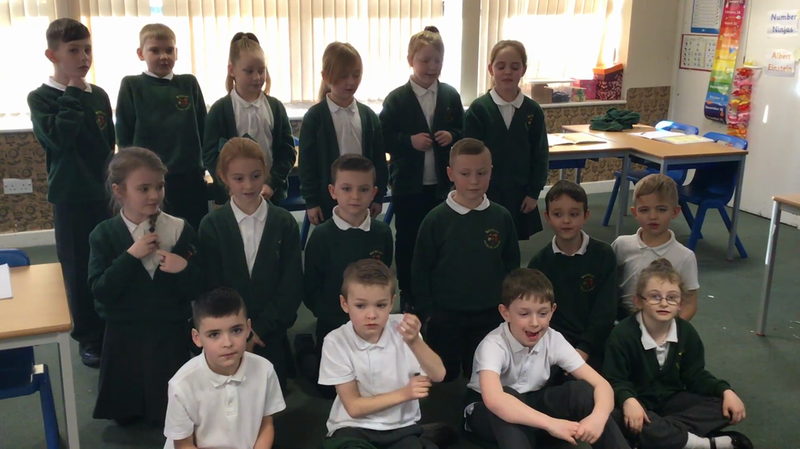 We announced our competition winners for our future architects and designers of a new playground. 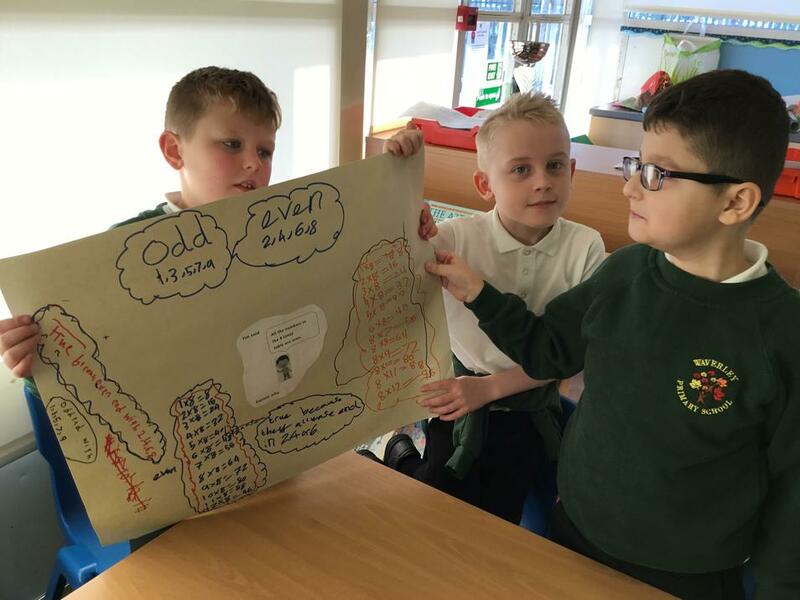 Class 3M have done a fantastic job creating models and scaling their measurements to full size by using their multiplication facts. 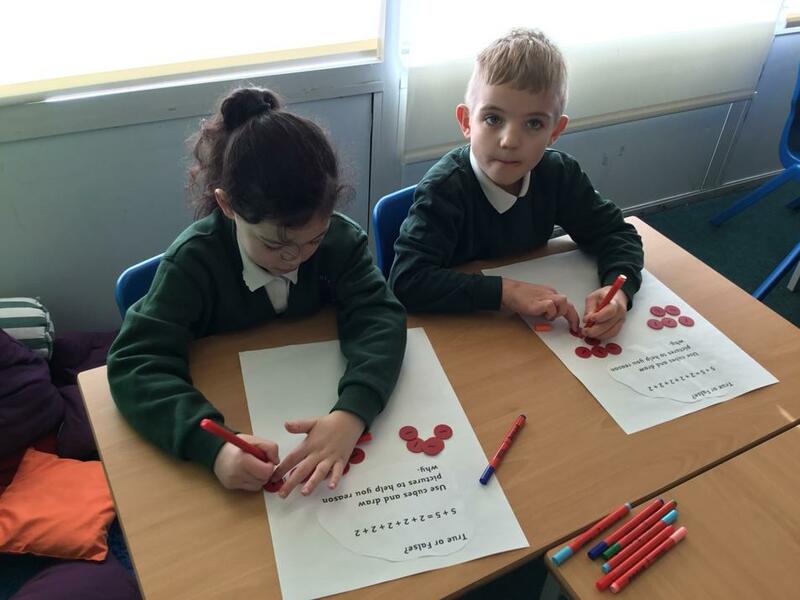 Well done Jessica who was given first prize for her Unicorn World playground, Scott who came second for his excellent scaling using his three times tables, third prize for Anna and Sophie on their Wood Park theme for young children. 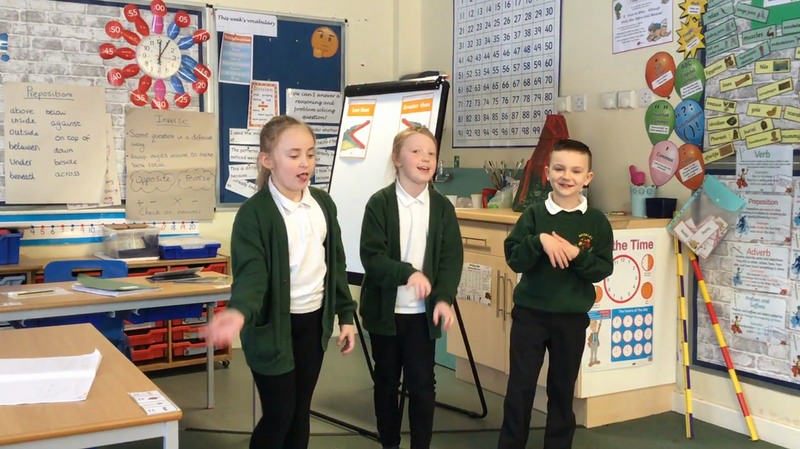 We also performed a poem from 'The Iron Man' that each group individually created. 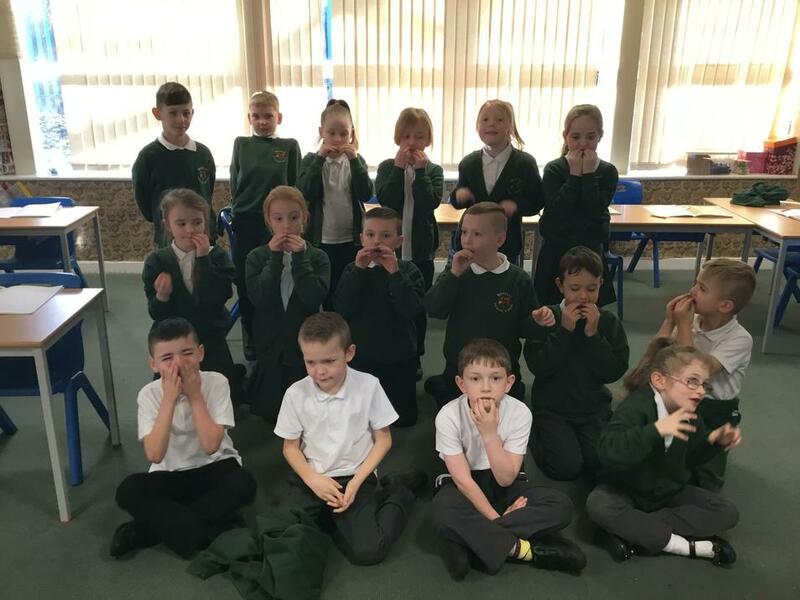 We have been working hard at learning our lines through role play as well as changing the tone and expression in our voices to excite the audience. 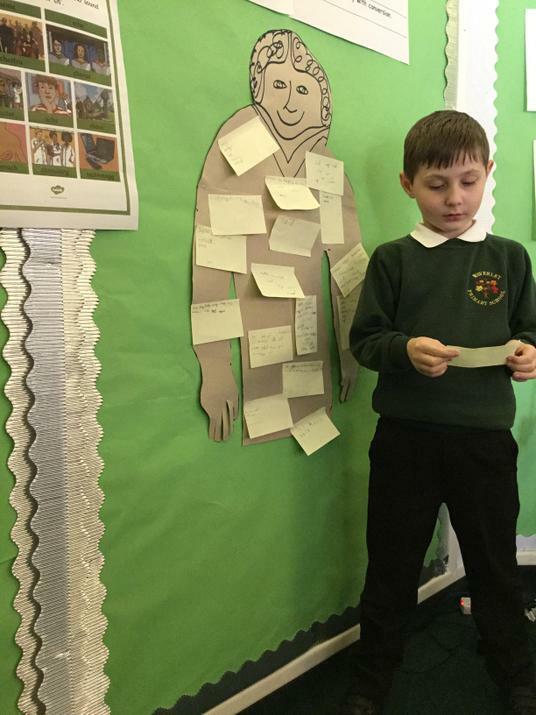 The Iron Man has got even more exciting this week as we begin to describe the characters and setting using a range of language. 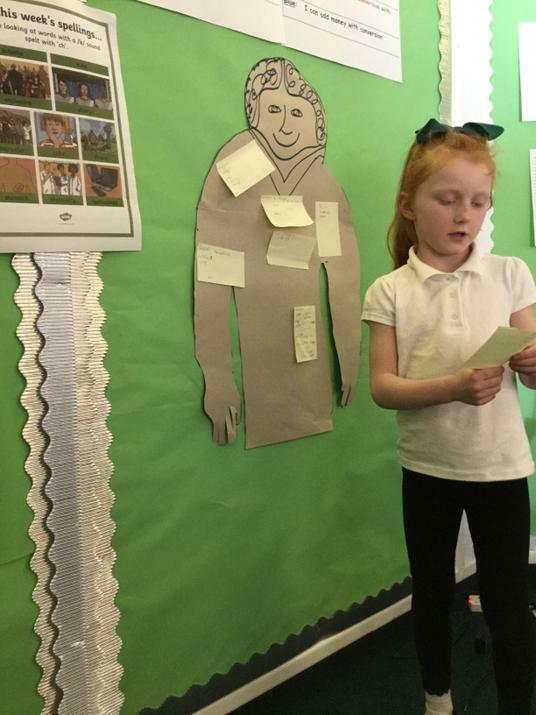 Using the author's description of the Iron Man - 'his head was as large as a bedroom and square like a dustbin' we decided to map out his head and hands to see what size it must be like in real life. Freeze Frame for CRASH CRASH CRASH the Iron Man slowly fell down the cliff. The Future Architects of Waverley. The Iron Man's head was as big as a bedroom! 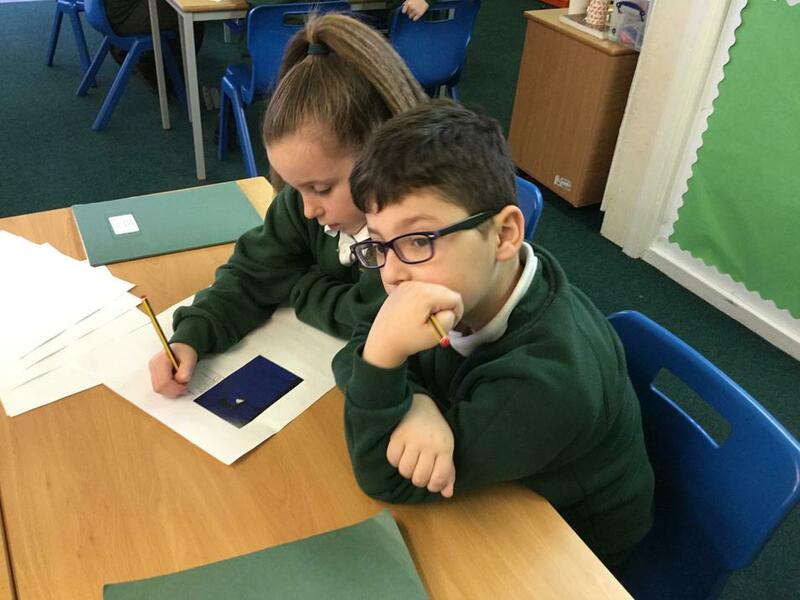 In Mrs McGovern's class we started work on our new book 'The Lost Happy Endings' by Carol Ann Duffy. 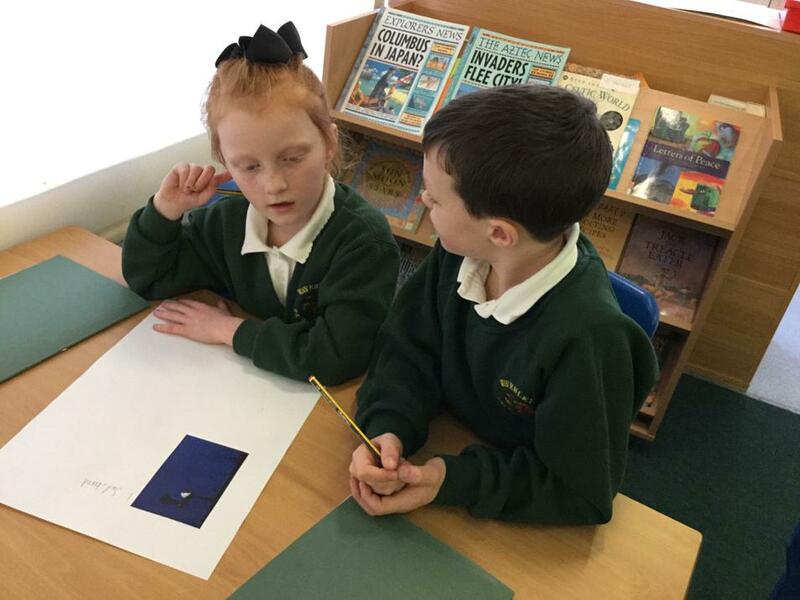 We started off by looking at the first image in the book and in pairs answering questions - 'What does the image remind you of? ', 'What comes into your mind when you look at this image? ', 'What is the little girl doing? ', 'Why do you think she is doing this?' and 'Who could she be?'. At this point we hadn't seen the book just the image. 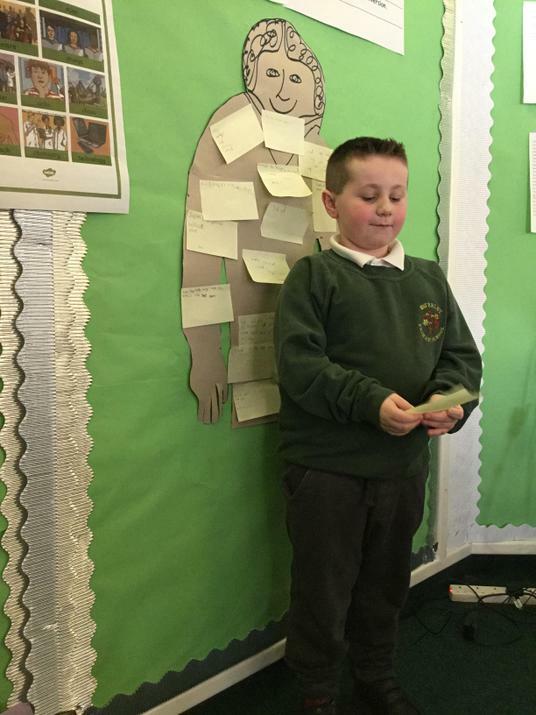 Lots of fabulous answers, opinions why and lots of book talk. 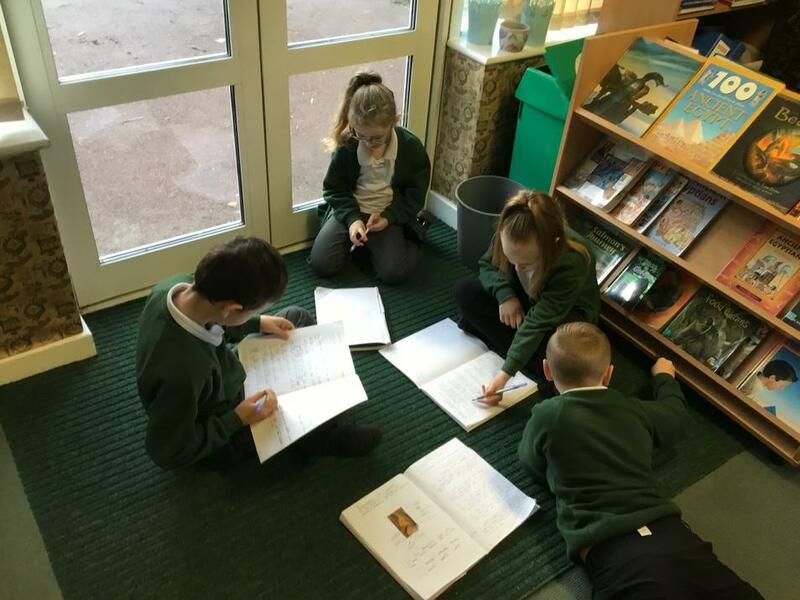 The Lost Happy Endings is proving to be a popular text which the children are really enjoying. 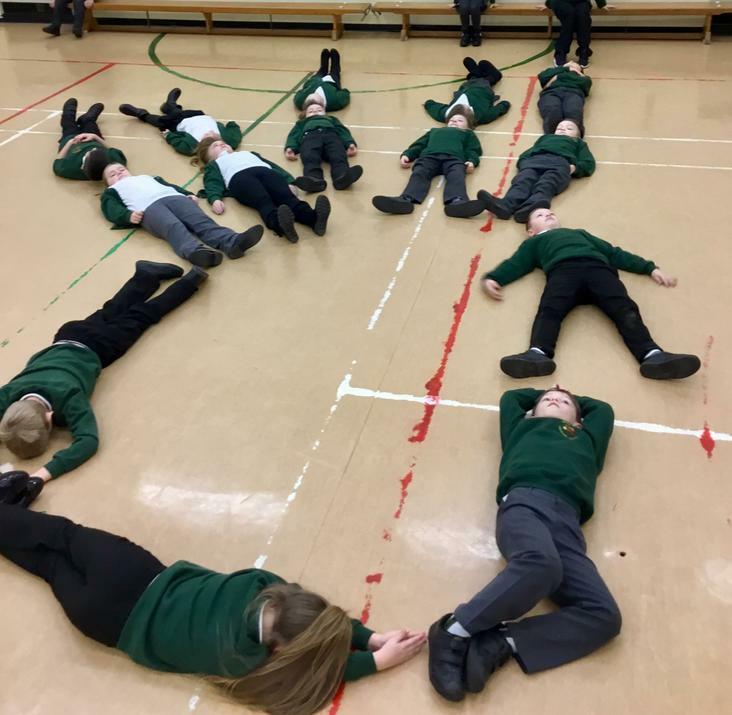 One task was to visualise an image from listening to an extract. 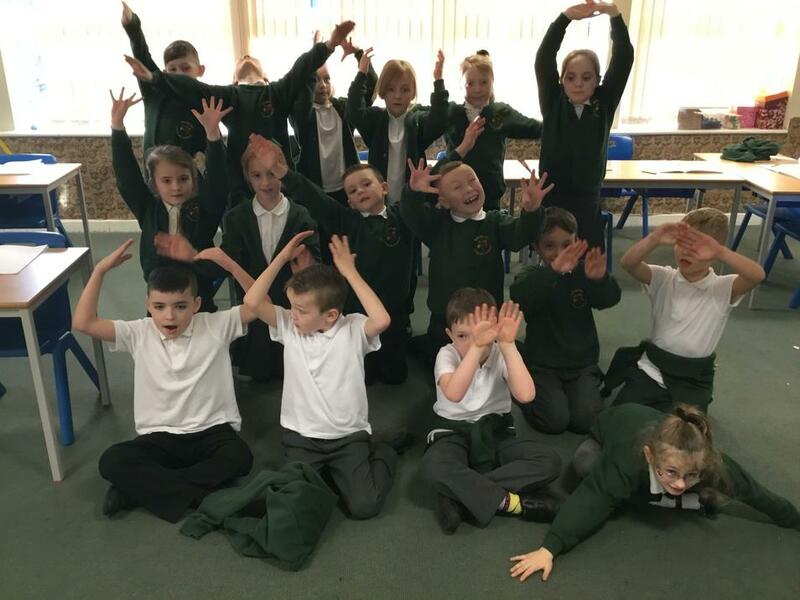 They closed their eyes and listened and then shared what they had seen in their imagination. These were then drawn on paper and finally annotated with words or phrases that came to mind as they were drawing. 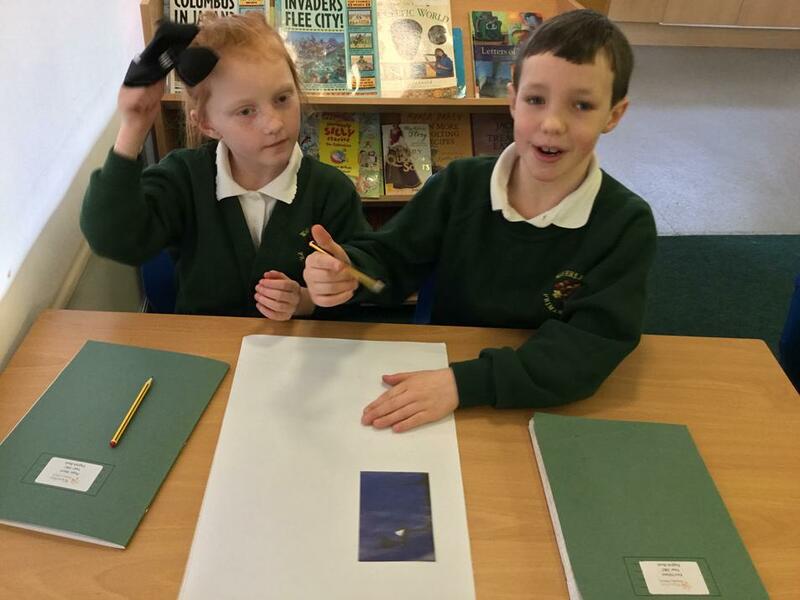 Visualising an image from listening to an extract. Egyptian homework is starting to come in too. Look at these fabulous Egyptian Pyramids using Lego! Well done. The United Nations has designated 2019 as the international year of the periodic table of chemical elements. 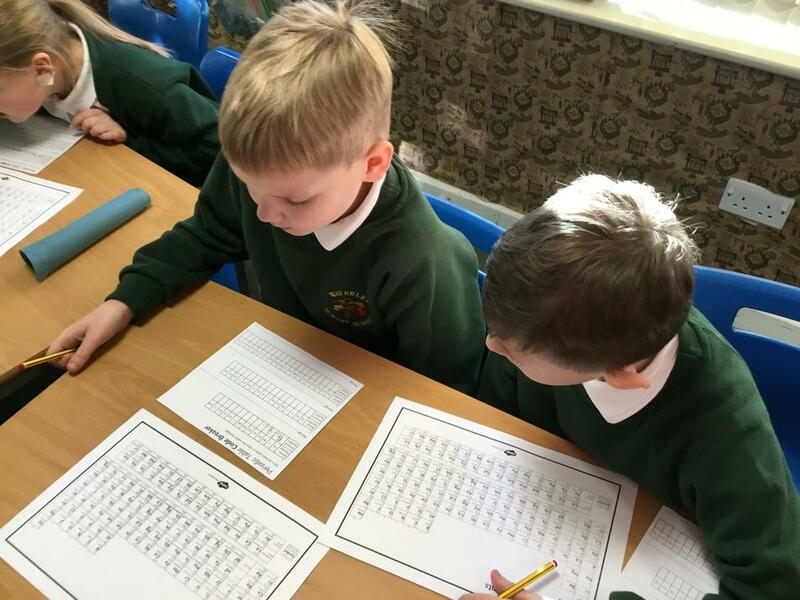 This week we celebrated the 100th anniversary of the periodic table by using the atoms of each element to solve secret codes. 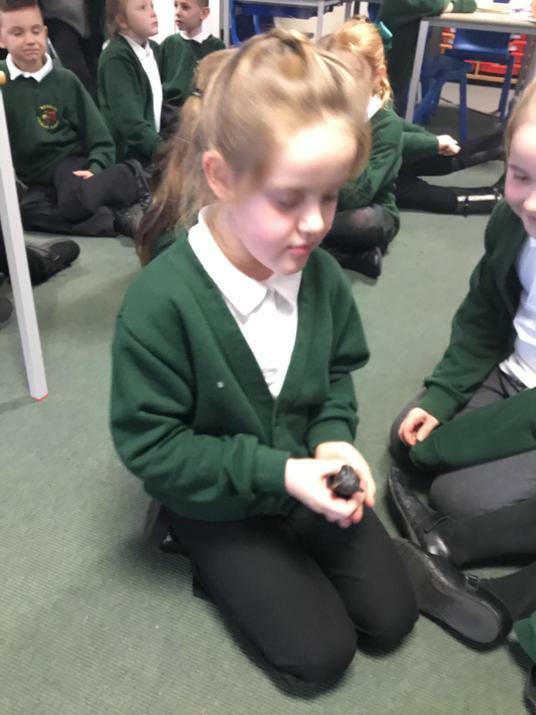 We also looked at some elements that we have learnt from science and topic such as gold, iron, hydrogen etc. 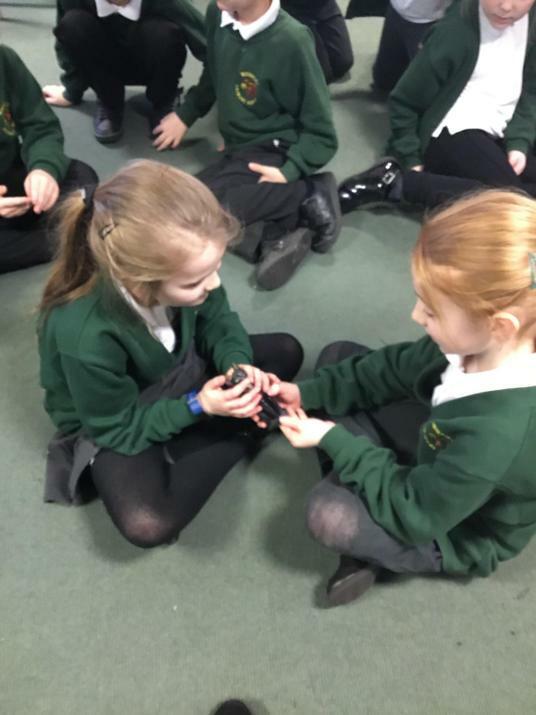 We have also been thinking about our team building skills and what features make a good team. 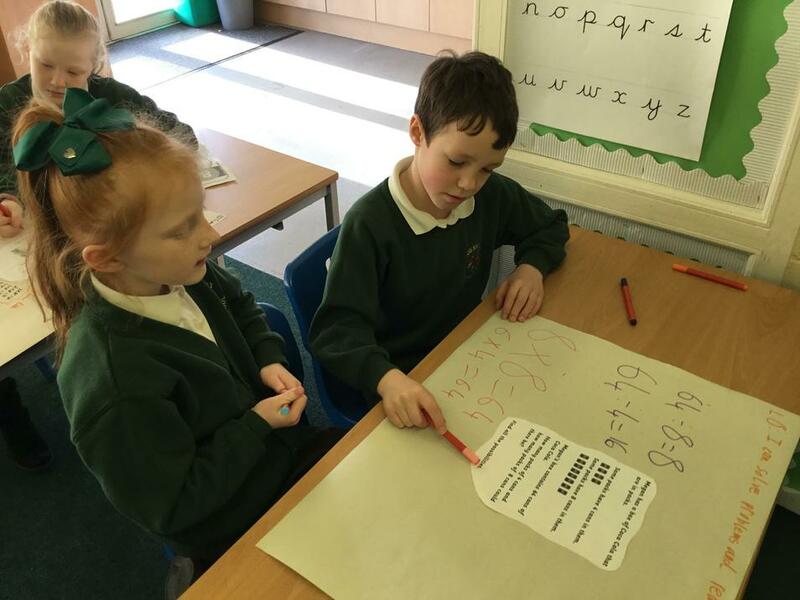 We worked as a class to number children 1 to 10 who had their eyes closed. 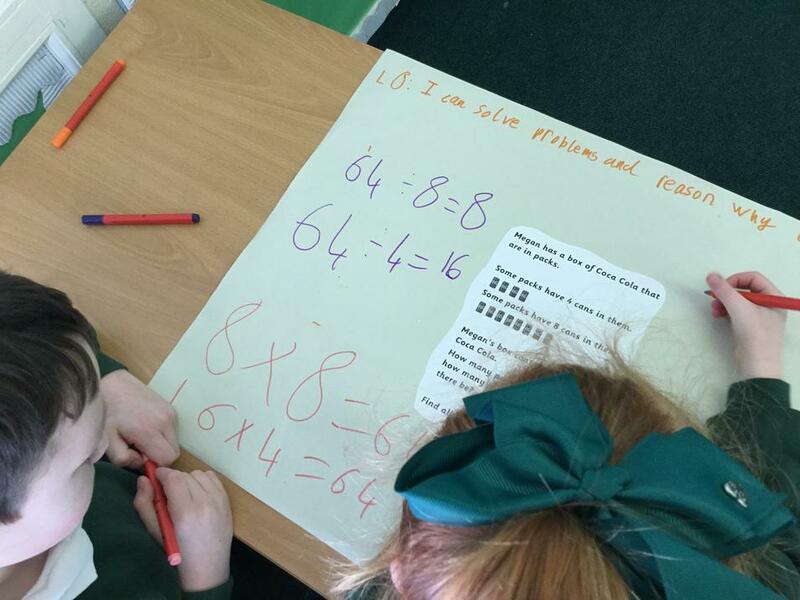 This meant we had to give clear instructions for the person whose eyes were closed to solve the challenge. 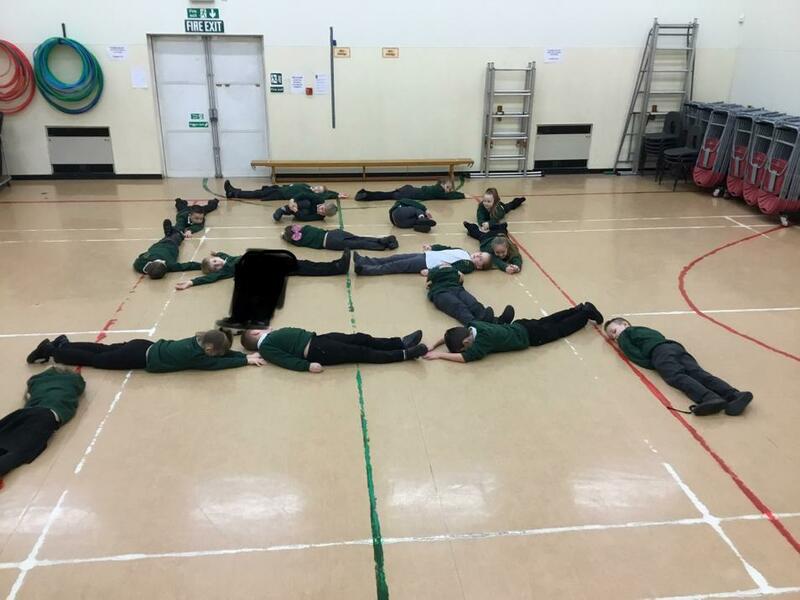 Well done class 3M for working together! 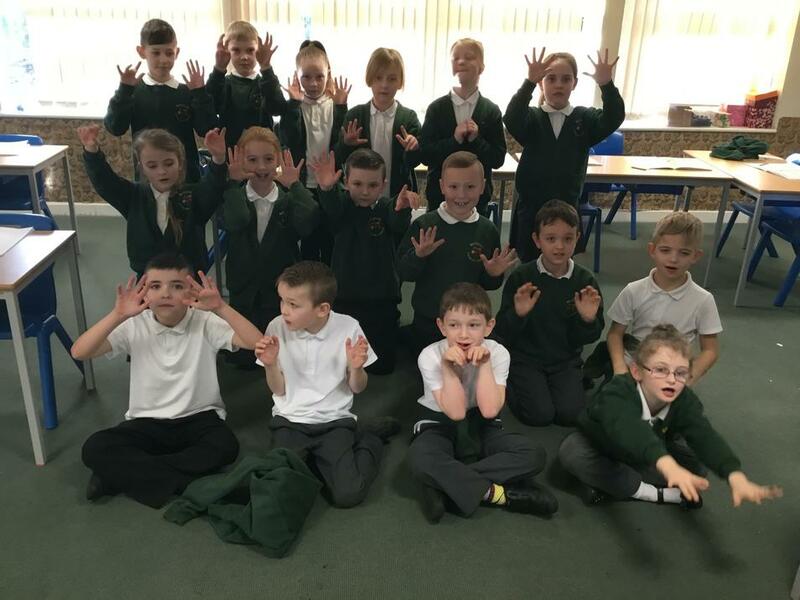 The future architects and designers of Class 3M. 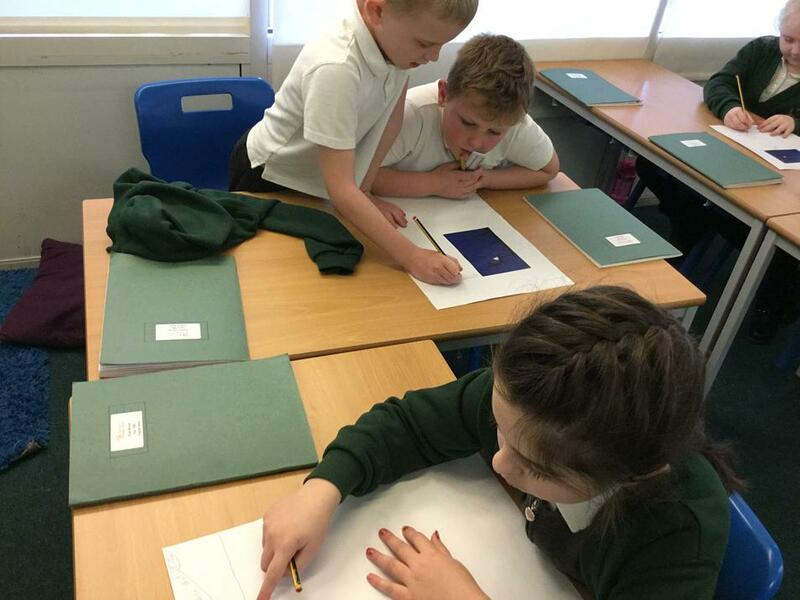 Class 3M have been measuring and designing a new playground for Waverley Primary School. We firstly went outside with our reflective jackets (pretending to be builders and architects) and measured all the different playground equipment. 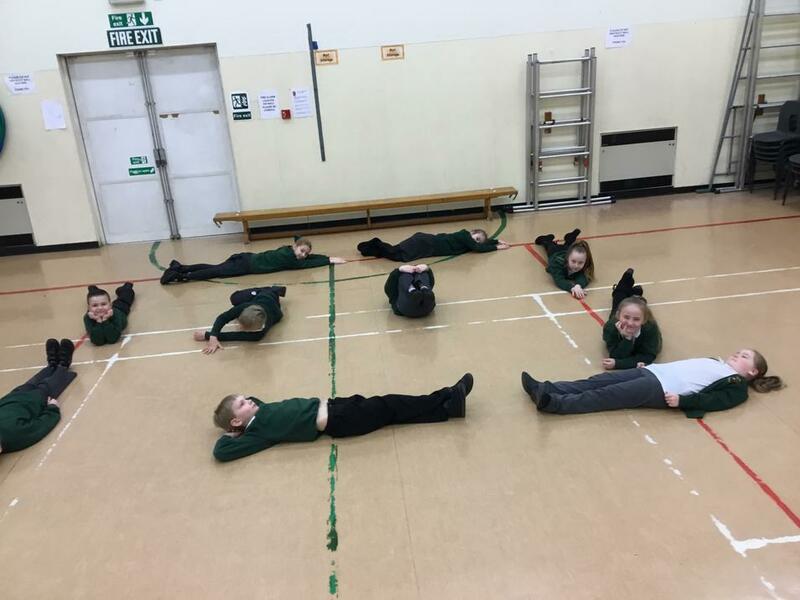 We decided what different equipment we wanted for our playground designs. We then designed different playgrounds, some us of designed natural playgrounds, playgrounds from story books and unicorn world playgrounds. Finally we used the measurements of our models to scale ranging from 1:2 to 1:8 using our multiplication facts. 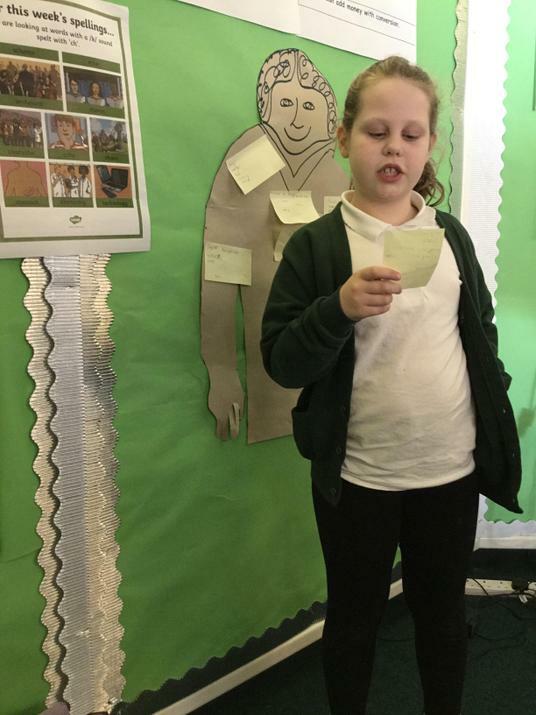 Sophie was extremely excited as she explained to the class that when her mum was at this school when she was 8 years old they were asked to design the playground that is outside now (We won't count how many years ago that was ). 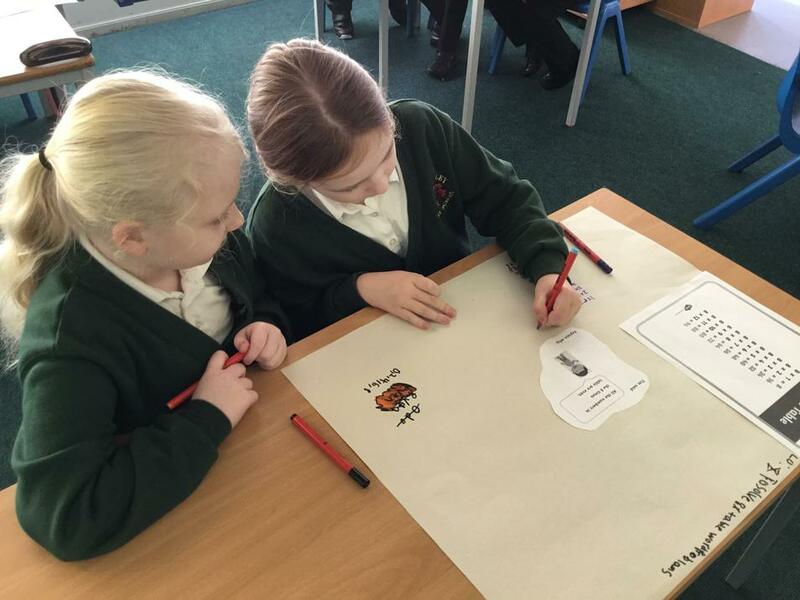 In Mrs McGovern's class we have continued with our information texts about beavers. 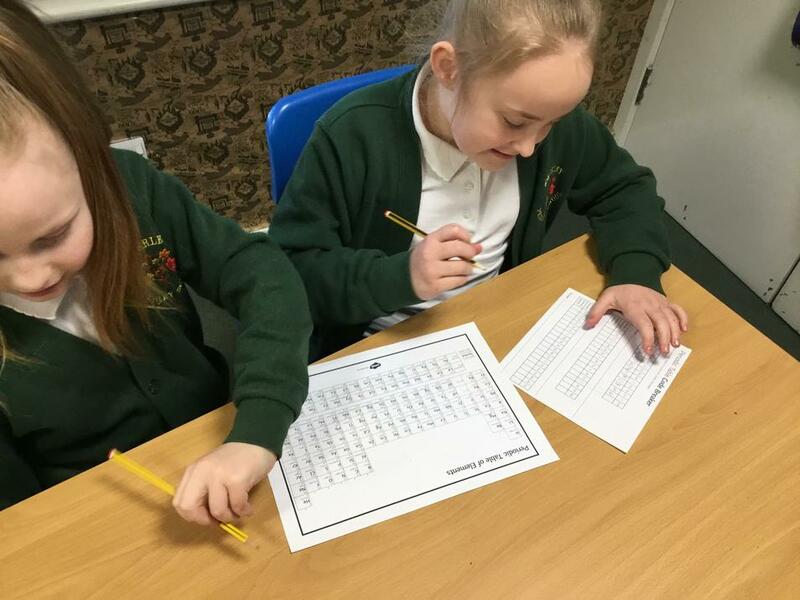 We are busy writing them up in our Science books and will then create leaflets and posters - watch this space. 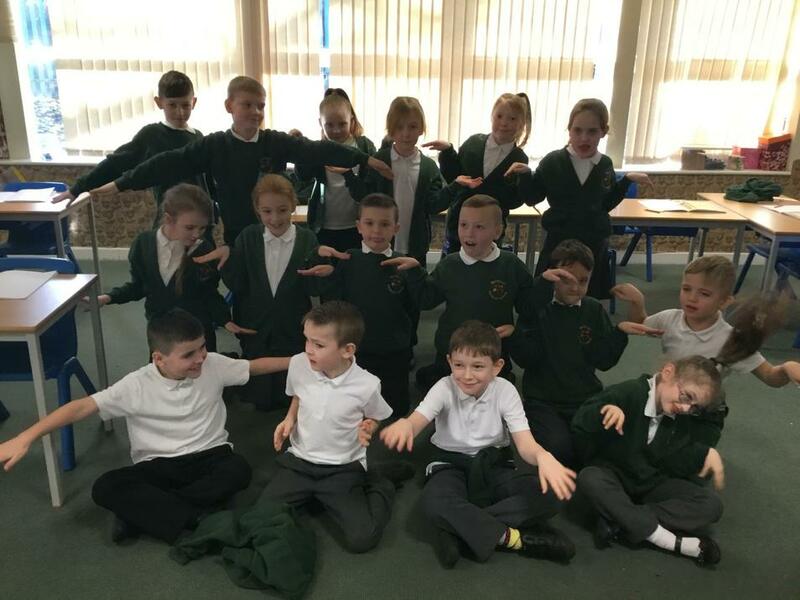 In Maths we finished our topic of multiplication and division by learning all about scaling and used a family of rainforest animals to illustrate it. 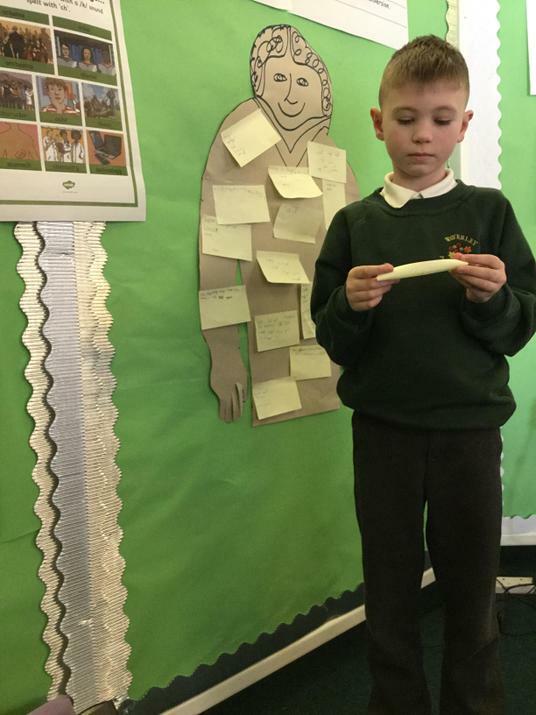 In Science we learnt all about the different types of skeletons - endoskeleton, exoskeleton and hydrostatic skeleton. Do you know what they are? 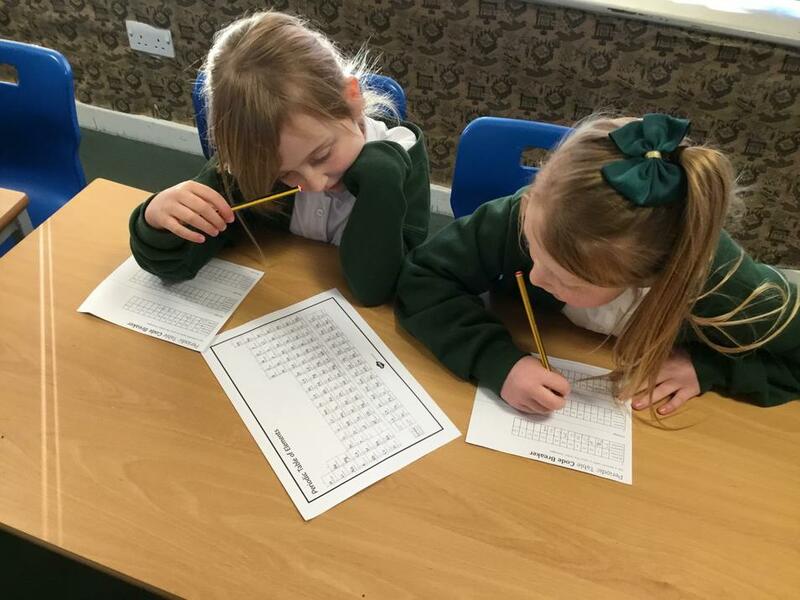 Can you name different invertebrates and vertebrates too? 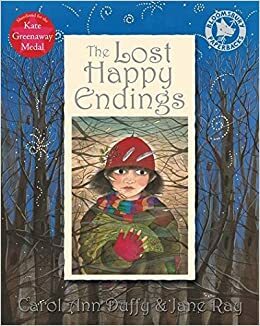 Next week we will be starting our new English book - The Lost Happy Endings by Carol Ann Duffy. 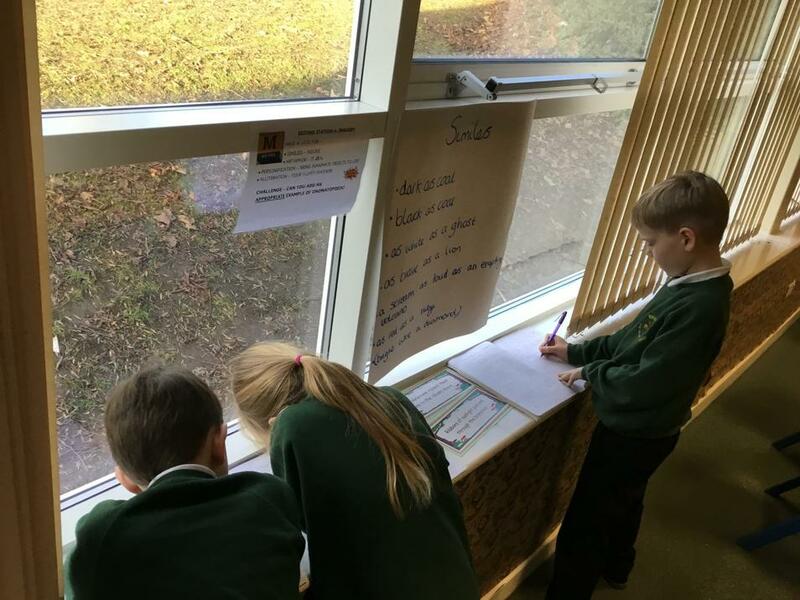 This week in English we have used different editing stations to improve our 'A monster ate Miss Mole' poem based on an imaginary trip to Egypt. I was eaten by some horrible creatures during our visit! 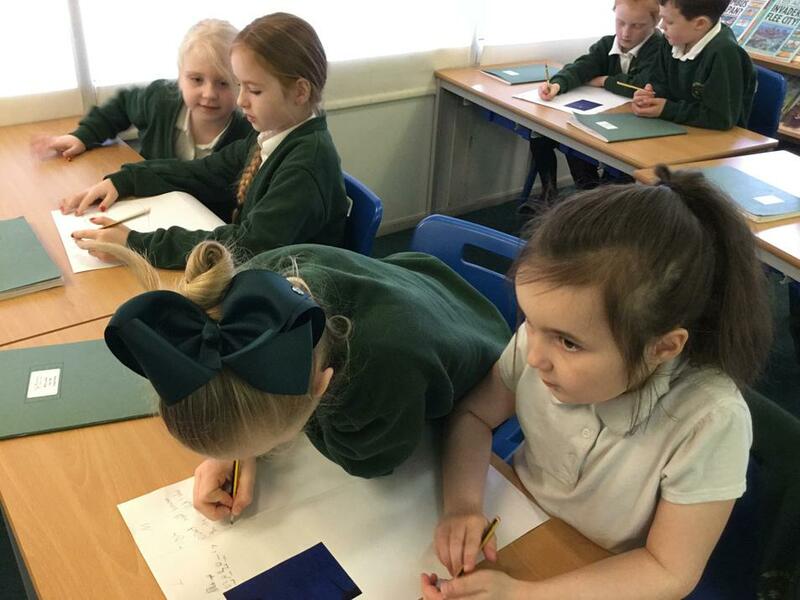 During each editing station children were looking at different ways to improve their own work. 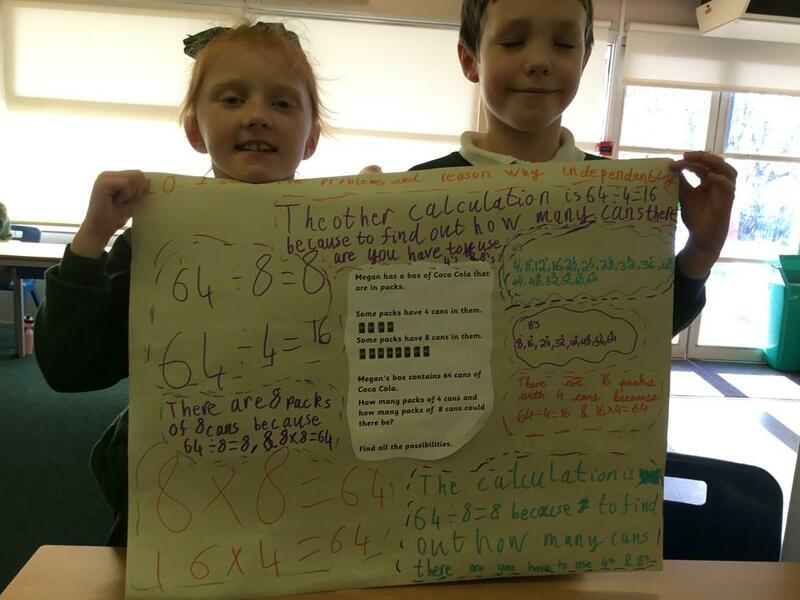 By the end of the lesson they were able to explain what they had done well and what they need to improve on. I look forward to reading the final poems of all the different Egyptian monsters that ate me! 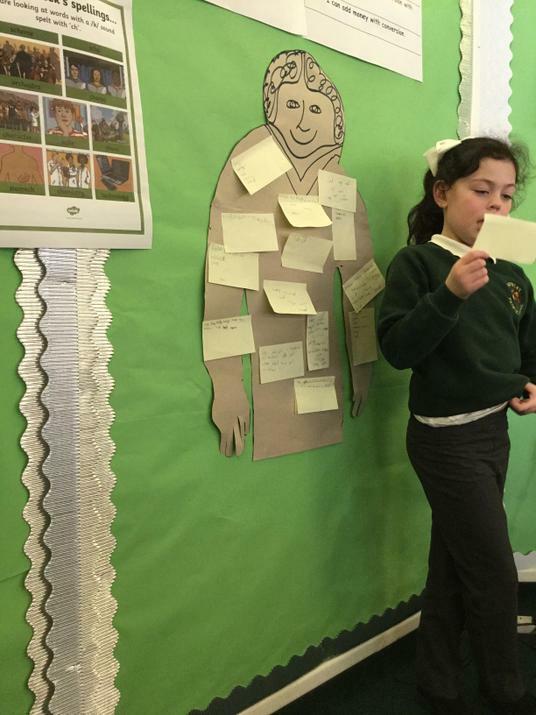 In Mrs McGovern's class we are continuing with information texts using The Chronicles of Narnia as a stimulus. 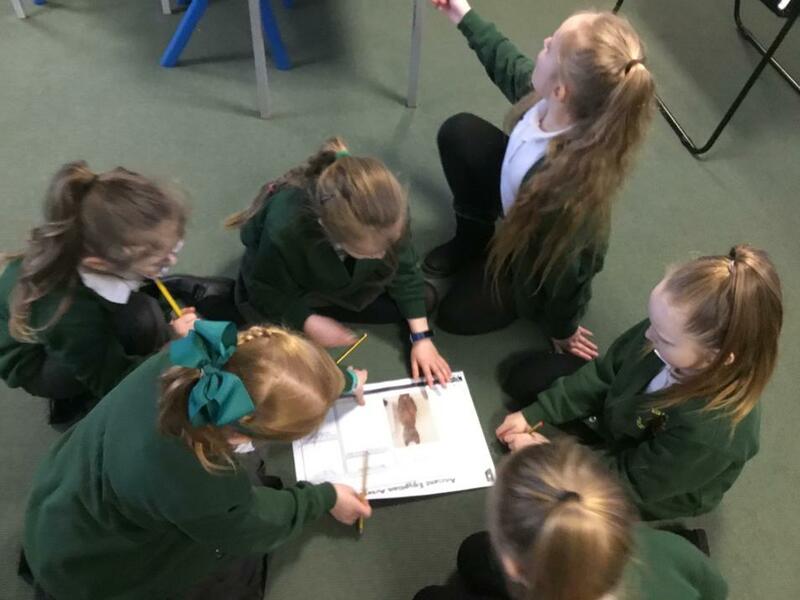 We have read up to the part when the beaver family are introduced. 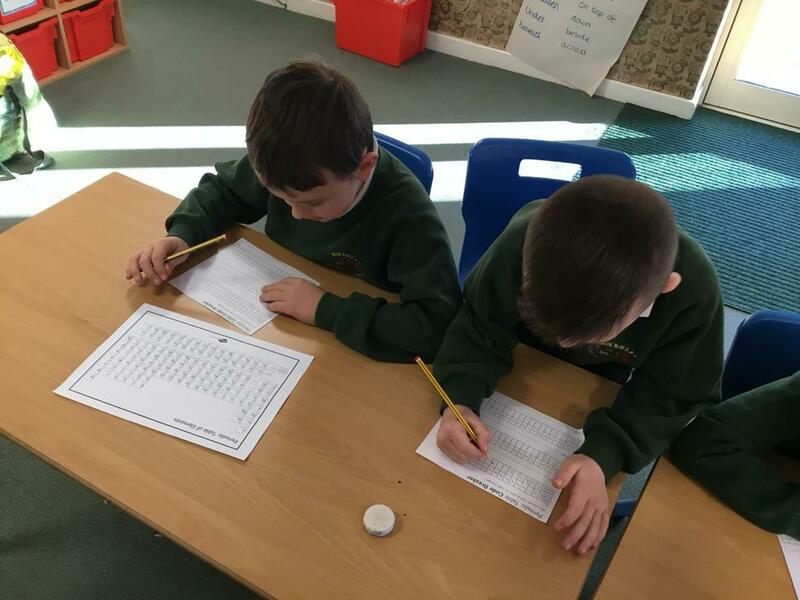 We decided to research about beavers using note taking skills and then writing up in full text. 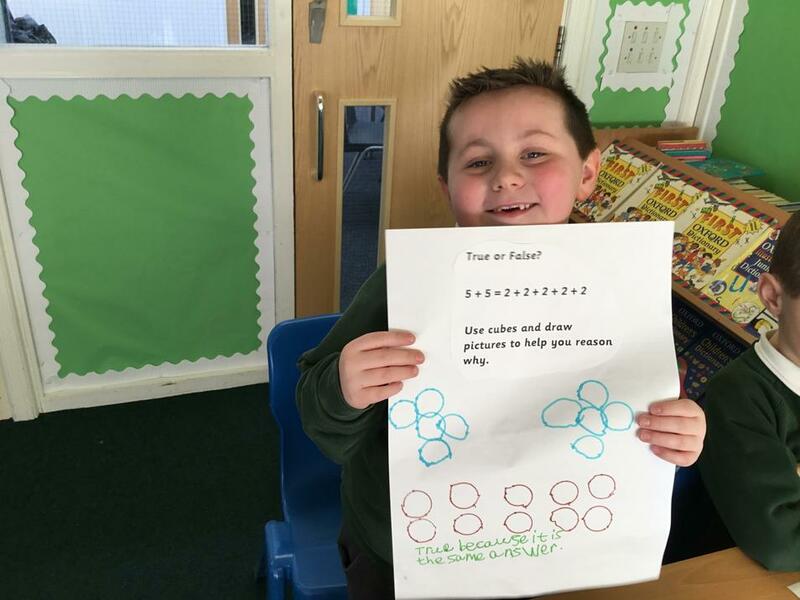 We are continuing this next week and will produce our very own information text all about beavers. 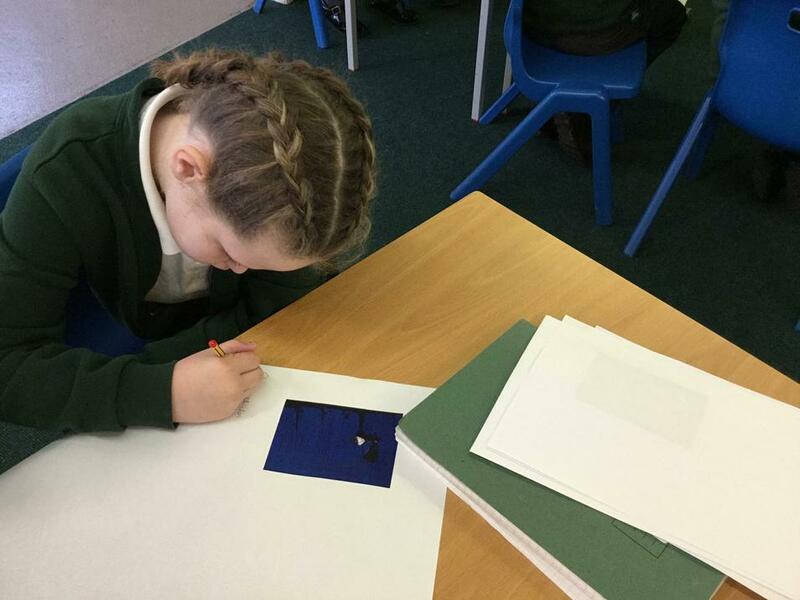 We looked at the work of Kandinsky in computing and recreated our own versions in Paint. 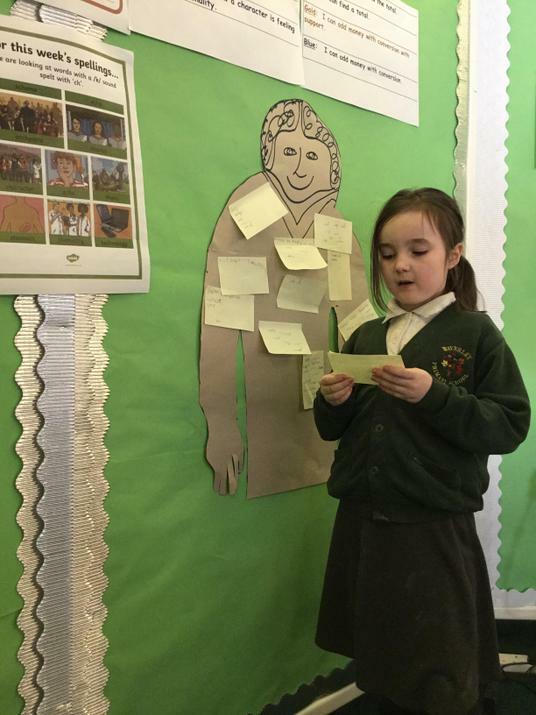 This week we have started our animals including humans topic. 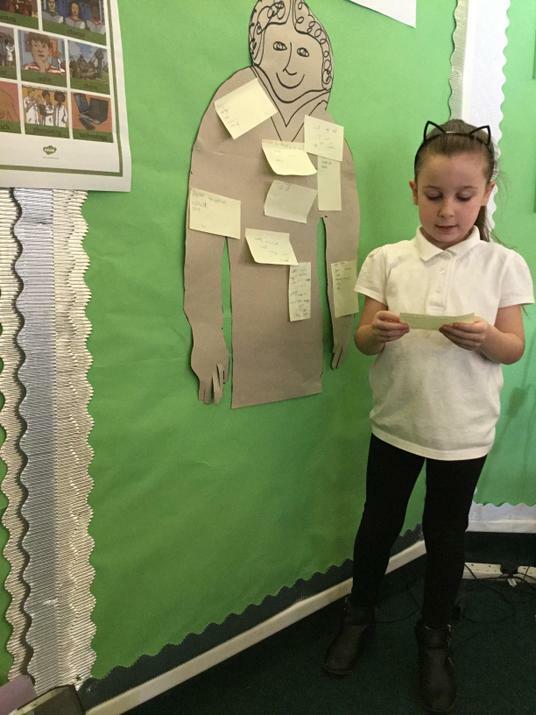 We researched what is needed to survive, we created a piece of role play to remember the process of plants making their own food. 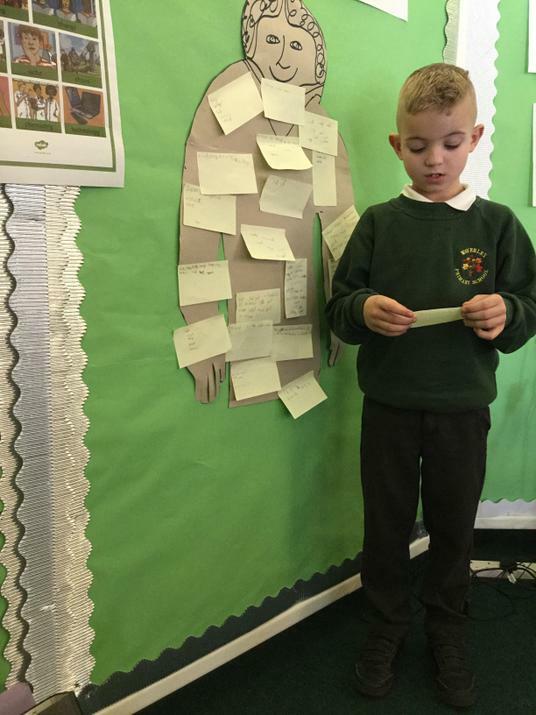 We created actions to remember what is needed for plants to make their own food. This process is called photosynthesis. They use water, sunlight and carbon dioxide to produce food in their leaves. 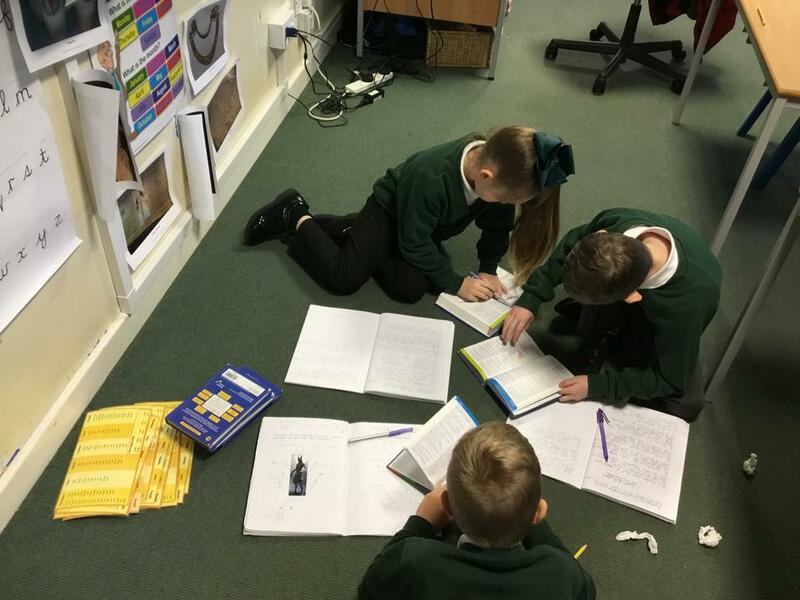 In Mrs McGovern's class we have started reading Narnia by C.S Lewis and we are going to link the fictional story to non fiction information texts by researching and writing about beavers (which make an appearance in the story). 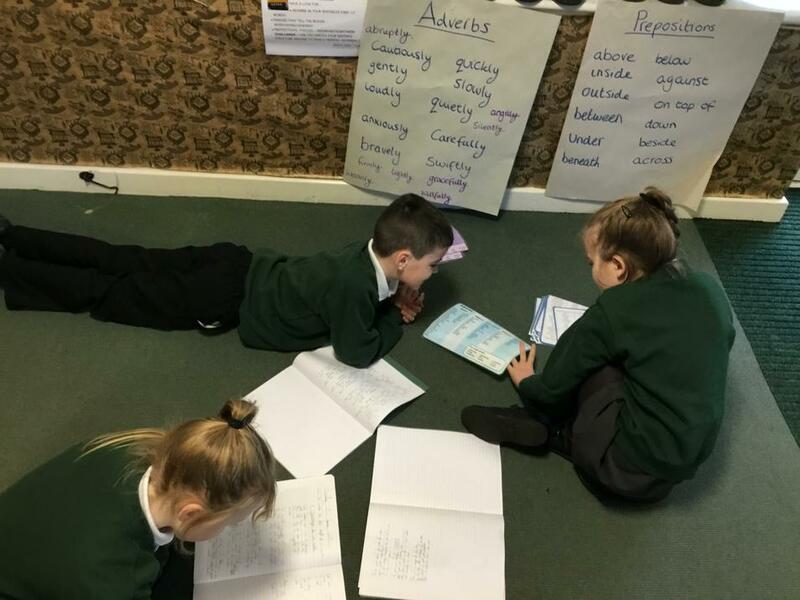 This week we have been discussing and identifying the features of an information text ready to start writing our own next week. 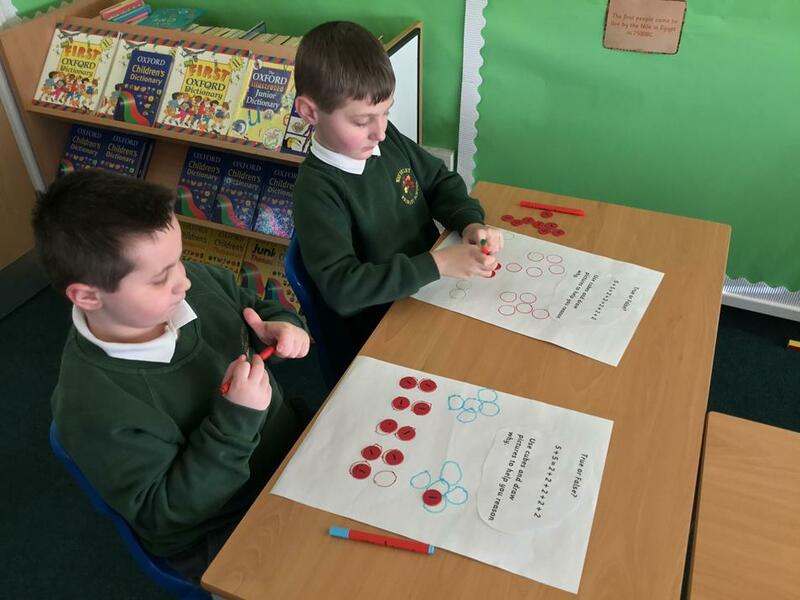 In Maths we have continued with multiplication and division. 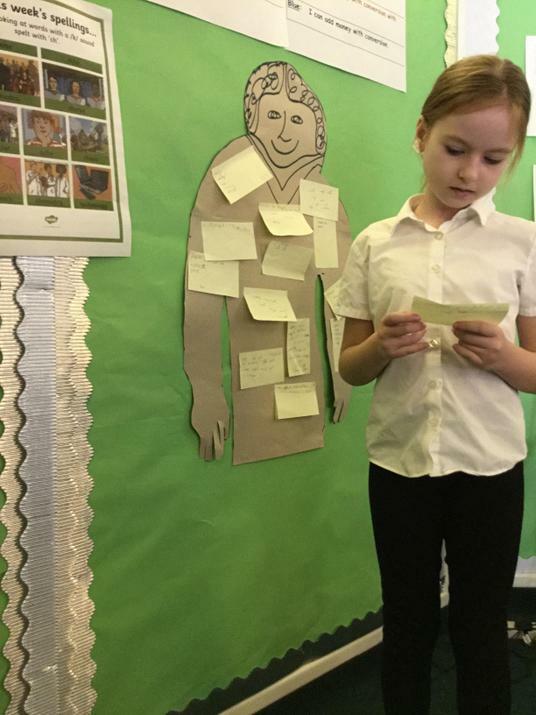 At the end of the week we solved problems and reasoned why we had to do what we did and why an outcome was what it was. We did that in pairs or groups of three working collaboratively on big pieces of paper. Take a look at the photos below. 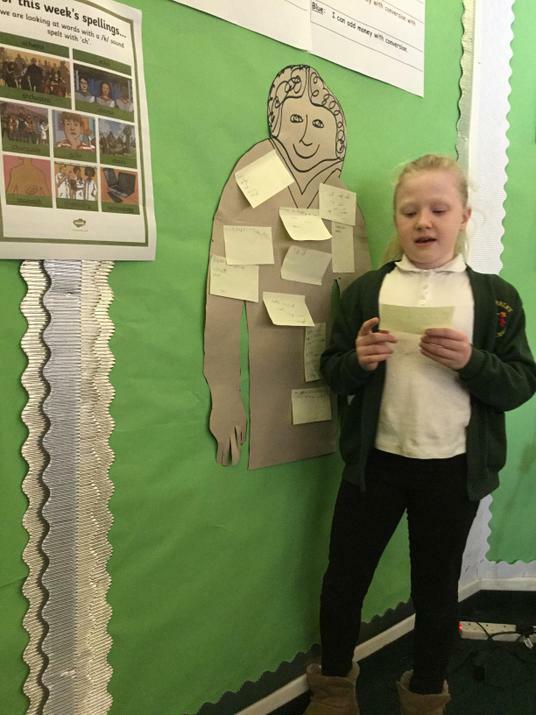 In English both classes have been writing, reading and performing poems. 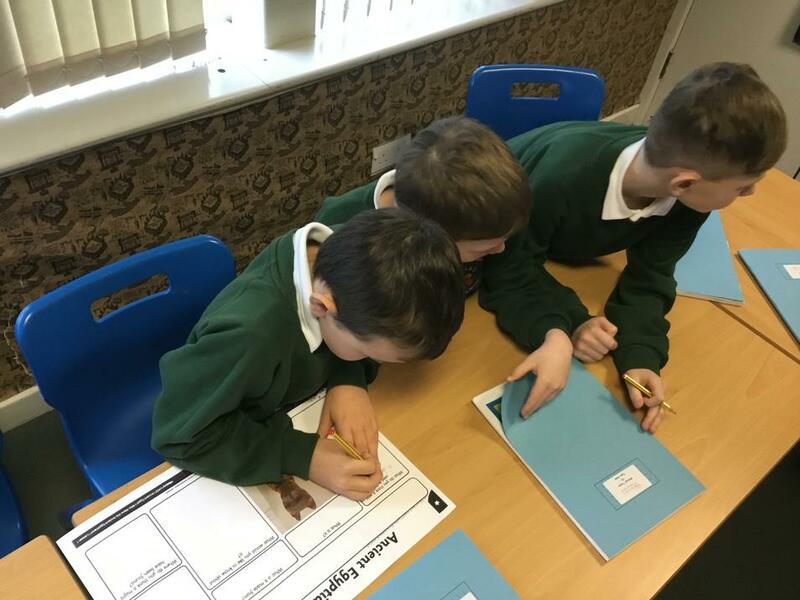 In Science we have started our new topic all about 'Animals including Humans' and in History we are going to be learning all about the Egyptians. A very busy term ahead. 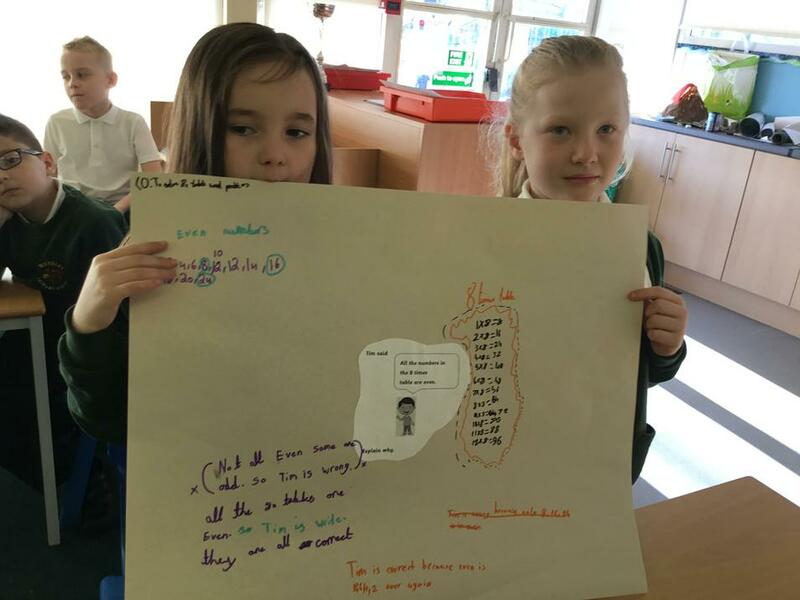 This week we have been looking at different Egyptian artefacts and asking questions to discover more about lives in Egypt.